Hypertension is elevated blood pressure, clinically defined as at or greater than 140/90 (systolic/diastolic) mm/Hg. Primary hypertension has multiple or unknown causes, and secondary hypertension has known causes. In most cases of primary hypertension, increased peripheral resistance is the reason for the elevated pressure. Even moderate elevation of arterial blood pressure is associated with a shortened life expectancy. Chronically elevated blood pressure leads to widespread damage to the circulatory system, arterial disease, cardiac failure, and even neurological impairments. total peripheral resistance: Total peripheral resistance (TPR) is the sum of the resistance of all peripheral vasculature in the systemic circulation. Vasculature throughout the entire body can be thought of as two separate circuits—one is the systemic circulation, while the other is the pulmonary circulation. hypertension: The disease or disorder of abnormally high blood pressure. blood pressure: The pressure exerted by the blood against the walls of the arteries and veins; it varies during the heartbeat cycle, and according to a person’s age, health, and physical condition. Hypertension (HTN) or high blood pressure, sometimes called arterial hypertension, is a chronic medical condition in which the blood pressure in the arteries is elevated. This requires the heart to work harder than normal to circulate blood through the blood vessels. Blood pressure involves two measurements, systolic and diastolic, which depend on whether the heart muscle is contracting (systole) or relaxed between beats (diastole). Hypertension is classified as either primary (essential) hypertension or secondary hypertension; about 90–95% of cases are categorized as “primary hypertension” which means high blood pressure with no obvious underlying medical cause. 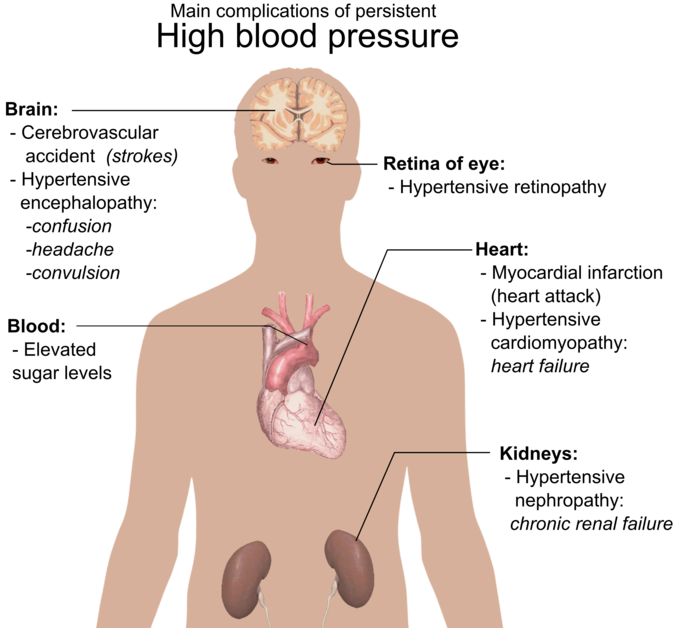 The remaining 5–10% of cases (secondary hypertension) are caused by other conditions that affect the kidneys, arteries, heart, or endocrine system. In most people with established essential (primary) hypertension, increased resistance to blood flow (total peripheral resistance) accounts for the high pressure while cardiac output remains normal. This increased peripheral resistance is mainly attributable to structural narrowing of small arteries and arterioles, although a reduction in the number or density of capillaries may also contribute. Secondary hypertension results from an identifiable cause. Renal disease is the most common secondary cause of hypertension. Hypertension can also be caused by endocrine conditions, such as Cushing’s syndrome, hyperthyroidism, hypothyroidism, and acromegaly. Other causes of secondary hypertension include obesity, sleep apnea, pregnancy, and coarctation of the aorta. There are many complications of chronic hypertension. Hypertension is a major risk factor for stroke, myocardial infarction (heart attacks), heart failure, aneurysms of the arteries (e.g., aortic aneurysm), peripheral arterial disease, and is a cause of chronic kidney disease. Even moderate elevation of arterial blood pressure is associated with a shortened life expectancy. Dietary and lifestyle changes can improve blood pressure control and decrease the risk of associated health complications, although drug treatment is often necessary in people for whom lifestyle changes prove ineffective or insufficient. High Blood Pressure Complications: Persistant high blood pressure can affect many areas of the body.